Opening Day is fast upon us and MLB rule tweaks abound. This year MLB continued to tackle the safety of its players and the speed of the game in a set of new rules released last month. One revamp near and dear to Mets fans’ hearts involves tighter guidelines for sliding into second base. The change comes after last year’s hotly contested postseason slide by Chase Utley–which took down Ruben Tejada and broke his right fibula during Game 2 of the NL Division Series–though MLB has been careful to distance the change from any mention of the play. Changes for the 2016 season include the institution of 30-second time limits on visits to the mound by pitching coaches and managers and the alignment of between-inning breaks more strictly to the broadcast advertising schedule. These come on the heels of 2015 addendums that required batters to keep a foot in the box for their entire at-bat, which cut more than six minutes off the average game time. Even more pace-of-play alterations are being tested in the minors and fall leagues. Among them: a 20-second pitch clock in the Double and Triple-A levels, no-pitch intentional walks, and time out limits, suggesting that the majors might expect more changes in this vein in the future. And that’s not to mention more of the outlandish proposals, including a suggestion by that same anonymous MLB exec who advocated for a seven-inning game. Of course it’s true that baseball is a slower game than, say, basketball, more consistently paced than the stop-start nature of an NFL game. But to my mind, this is not the reason why it fails to engage a younger generation. The issue is really a matter cultural positioning—MLB, perhaps in keeping with its current aging fan base, projects an image of itself steeped in old-time nostalgia. In addition to literally coming off as “old,” that also lends itself to misogynist, homophobic and racist ideologies, which are then engrained in the organization right on down to its fans. What was it about those girls that drew such disdain from the cameraman and announcers? Did the girls look silly making duck faces into their phones en masse? Of course. But so do the hundreds of grown men who paint their faces, wear superhero costumes, wave towels, chant, and scream, to say nothing of the drunk and disorderly. Was it because the girls were preoccupied and not paying attention to the game? Unlikely. Baseball is not a game that requires the rapt attention of its viewers for three straight hours. Fans know this. Red Sox season ticket holder Stephen King, virtually always reading a book in the stands, is a beloved staple of the Fenway Jumbotron. No mocking there. Most likely it was the fact that they were behaving like teenage girls often do, and this annoyed the old-man announcers, who knew a mockery of the girls would be of interest to the old-man fans. The result? The Diamondbacks apologized, but couldn’t get the girls to come back if they paid them—when the team offered the girls free tickets, they donated the tickets to charity. At times, the Mets appear to be on the savvier end of the MLB spectrum. 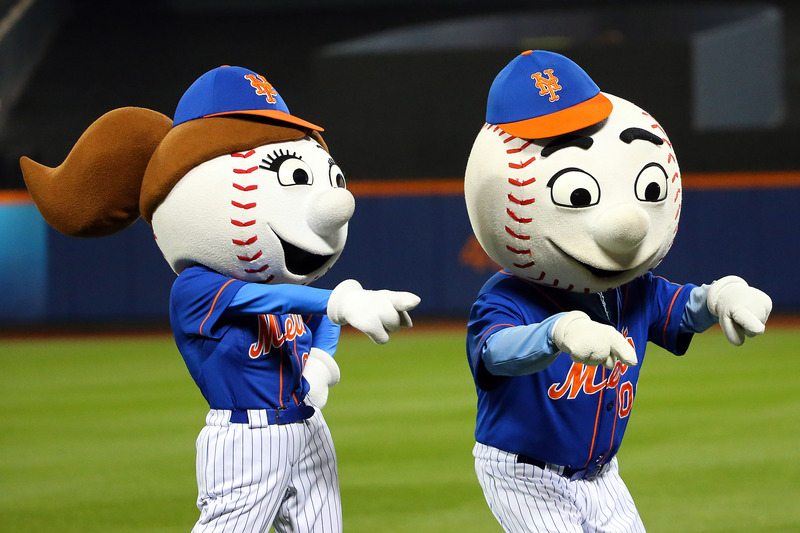 The introduction of a feminine Mets mascot seems to be an explicit gesture toward female fans. In terms of social media, the organization routinely interacts with fans through @Mets and @Metsbooth Twitter accounts, updates its tumblr at an above-average clip, and uses the hashtag #citivision to integrate fans’ Twitter and Instagram feeds with the Citi Field Jumbotron. But the Mets have also had some Jumbotron drama of their own, when they came under fire for a homophobic kiss-cam joke in which the camera’s heart encircles two players from the opposing team. After taking heat on Twitter, the joke was officially removed from the Citi Field repertoire in September 2015. And then there’s the Mets’ theme song: “Bring your kiddies; bring your wife / Guaranteed to have the time of your life.” The assumption is that the straight man is both the only baseball fan and the dominant head-of-household who carts kids and wife around as he pleases. As long as MLB continues to perpetuate old school gender roles and social hierarchies, the majority of humans—women, people of color, LGBTQ people, even the straight, white men of younger generations who don’t see their values reflected by MLB’s values—will continue to receive the message that baseball is not for us. For my own part, a lifelong Mets fan apparently despite myself, I am routinely frustrated by the way baseball culture tries to exclude me. Beyond the blasted fight song, I cannot buy a Mets shirt that will fit my body and not look like a glitter unicorn threw up on the thing. I cannot venture out in public wearing my Mets hat without men staging an inquisition, incredulous that I might actually like baseball. (“What was the name of the shortstop who stubbed his toe in that one game in 1964?“) This kind of trick question test is never leveled at a male—it’s assumed he is a “real fan.” And while some might want to draw a line between the behaviors of an organization and that of its followers, the word “followers” itself suggests the two are inextricable, and the change within baseball culture cannot be enacted without support from the top. It’s going to take more than a Mr. Met with eyelashes to truly create a convivial culture for a modern, diverse fan base. It’s going to be harder than pitch clocks and break timers. Major League Baseball needs a mindset shift, to transform itself from a backward-looking, stereotype-perpetuating organization to an inclusive one that is open to collaboration from those outside the straight white male consortium. The fact that baseball’s pace is slower than that of our modern lives is not to its detriment—those slow, sunny days at a ballpark are part of what makes it so great. Americans need a time out from their busy schedules now more than ever. If only the organization would welcome everyone at the old ballgame. The first item in the women’s section of the Mets MLB shop is a women’s cut jersey in pinstripes or blue available in sizes S to XXL. None of the Mets jerseys for sale are pink and glitter unicorn-vomit ones. If you can’t afford the $80 for one from the official team store a quick search of Target or Walmart should help, but you might have to settle for a jersey-looking t-shirt. That the MLB is something my son is at risk of not being able to enjoy as much with his child 20 years from now is depressing and worrisome. It’s not like it’s impossible for a once-major sport to fade to irrelevance (hello boxing!). I question though whether what is holding it back is is that it isn’t accommodating to POC, LBGTQ, women, etc. MLB players are 40% POC. It is the only major American sport where Asian players are not oddities to be gawked at. I’d bet a bright shiny quarter that black representation in the MLB is almost at its lowest level since integration has a lot more to do with socio-economic factors of African-Americans in the US than with the MLB frowning on Home Run Dances. I thihnk Rian Wyatt touched on some of those issues for BP when Antwan Randle-El said he should have played baseball instead of football. Excellent article, thanks for the perspective. I appreciate that the Mets do seem to be making an effort, what with the things you listed and the first LGBT Pride night being scheduled for this year. There’s still plenty of work to do, and they’re far from perfect, but its a start. Mrs. Met is no help at all. In fact, she’s part of the problem. When asked where she has been all these years (since “Lady Met” of the 1960’s) the Mets replied “she was home taking care of the children.” Plus the way she sashays around the field is both curious and offensive. I don’t know a single woman who walks that way. They don’t need to change baseball to attract female fans, they just need people like those announcers to join the 21century and accept them.